After promising from the little box on the right-hand side that I would post this recipe, at last it is here. Just in the nick of time, before the British seasonal courgettes are finished. I know you haven’t been waiting with bated breath, but I can’t believe I have waited so long to post this fabby soup. I love soup (as any right-minded person would) and this one is one of my most favourite, and easiest to make. Because it is so quick and simple it often features at my summer Maggie’s Centre nutrition workshops, where everyone seems to really enjoy it and want to make it at home. Energy and tastebuds certainly take a hit during cancer treatment so it’s great to have a bung it all together kind of recipe that tastes great, is nutritious and freezes well for another day. I am always immensely pleased when anyone says that they enjoyed their lunch at Maggie’s, but especially so by those whose appetite and taste are affected by treatment. I will be putting more of my easy, Maggie’s Centre-tried and tested recipes up for you and your family to try. In the meantime I really hope you go for this one. If you like Italian tastes but want something ultra-light, creamy-tasting but still filling, this might just do. 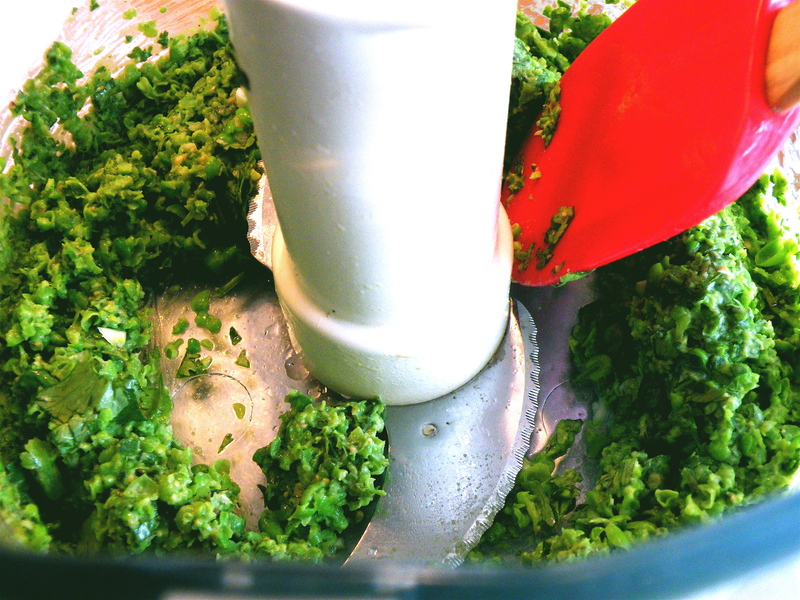 Bang in the middle of summer I make my own cheese-less pesto with lush, fragrant garden basil, maybe adding in some pea-complementing mint. 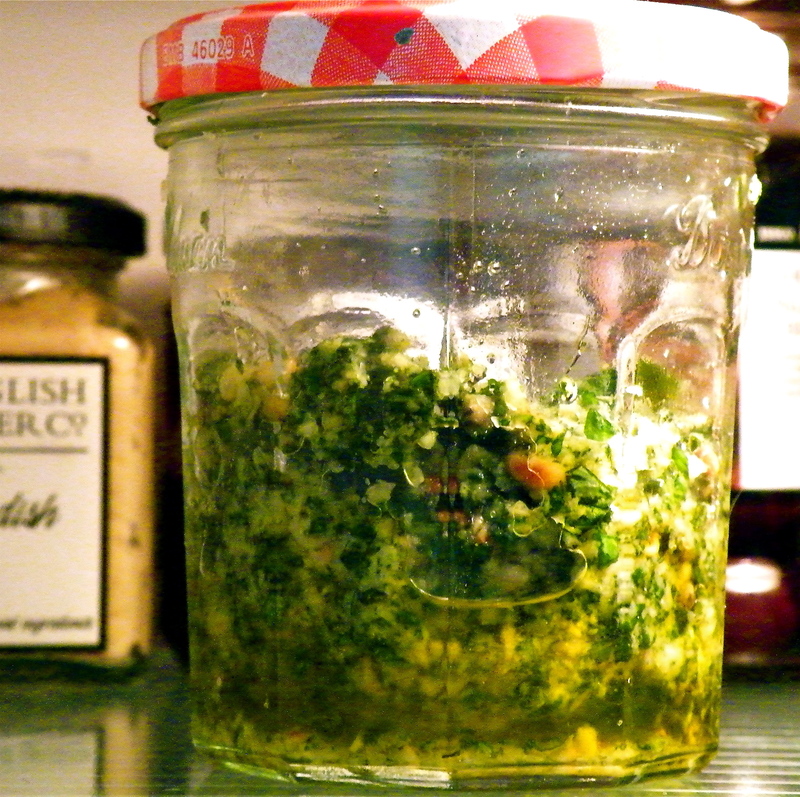 But right now, for large batches, I’m using refrigerated pots of decent ‘fresh’ pesto. Even the jarred stuff can be nice – just add a splash of lemon juice to balance the flavours: I reckon Lidl’s one is better than some of the Italian brands – and a lot cheaper. When I buy any prepared sauces and condimenty things I try to find ones that most closely match how I would make it if I wasn’t being so lazy (or, in your case, busy). All of the photos show a fairly naked soup, but at home we really like it with crunchy homemade croutons or maybe a slice of grilled gorgonzola-topped bread. I’ll give you a simple crouton tip as well as my cheeseless pesto recipe, but it’s lovely even with jarred pesto and a slice of good, seedy bread. Nutrition notes: I waxed lyrical about courgettes in my Courgette-Parmesan Frittata post but here I will briefly highlight a bit from all key ingredients. If you are making the pesto you will be getting some bona fide goodness from the basil. It’s highly anti-bacterial, anti-inflammatory and stuffed full of blood-clotting and wound-healing Vitamin K – all very useful whether or not you are being treated for cancer. Organo-sulfurs are immune-boosting compounds contained in onions and other members of the allium family (e.g. garlic, leeks, chives, shallots and syboes). Because they add so much taste – and because they have an incredible cancer–fighting profile – onions and garlic are foods we try and eat every day, in one form or another. Courgettes themselves, although not attention-grabbingly nutritious, are high in magnesium, which helps the body absorb and metabolise essential minerals like calcium, helping to prevent osteoporosis. And lastly, peas are ‘great balls of fibre’ (t0 mangle the pianist/songwriter Jerry Lee-Lewis’ prose), with good amounts of Vitamin A, some B vits, iron, calcium and protein. 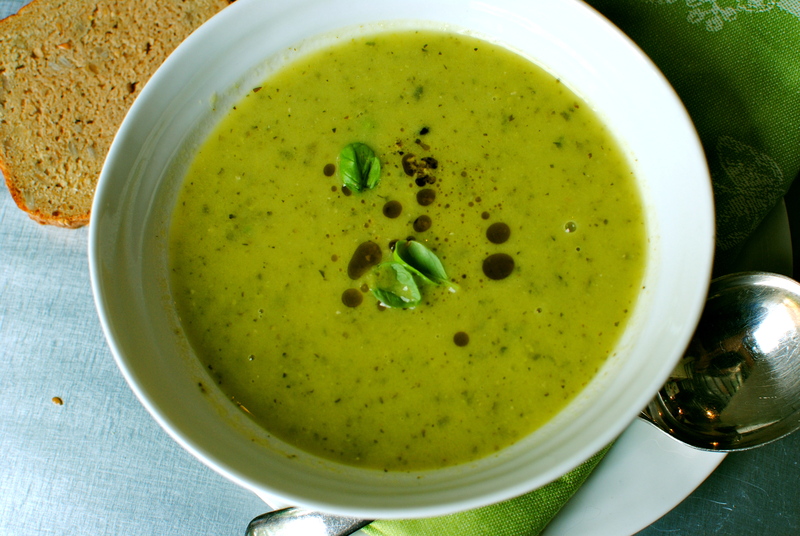 Peas are also the natural thickener for this soup, lending it a creaminess without any artery-clogging cream. Heat the oil in a large, covered saucepan over a low heat. Add the onions and cook gently for about five minutes. Tip in the celery and courgettes, stir and cook, covered for a further five minutes. Add the hot stock and bring to the boil, then reduce to simmer and continue cooking for 10 minutes. Now add in the peas and the pesto and turn off the heat. 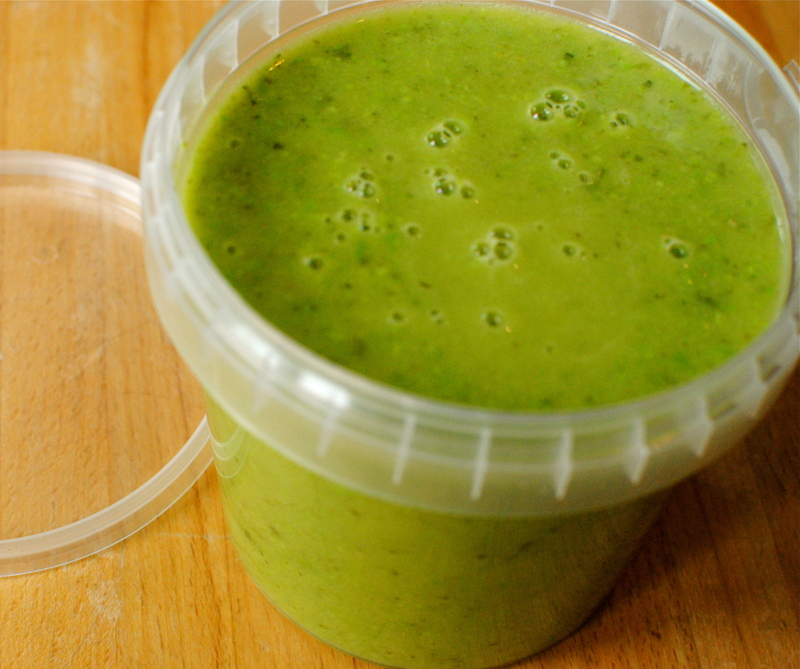 Let the hot soup cook the peas – about five minutes – then blend with a hand blender or in a food processor/blender. I like it with a bit of texture, but blend until velvety smooth if you like. Adjust the seasoning before serving with these easily made croutons: cube day or two-old country type bread and toss in a little olive oil (not a lot, about 1 tsp for each 20g of bread), pressing lightly until mildly saturated. Tip the cubes onto a baking sheet and pop into a preheated (180C/350F) oven for 7-8 minutes, or until golden and crisp. Use garlic or basil-infused olive oil if you have any – perfect for these croutons. I leave out the cheese for this because you don’t really taste it, but if you are making it for other things stir in 25g of vegetarian Parmesan or grana padano after blending the other ingredients. This recipe is easily doubled. Put 50g of basil leaves in a food processor and blend to a paste with 25g toasted pine nuts and two chopped garlic cloves. With the processor still running gradually add in 50ml of extra virgin olive oil and the juice of half a lemon (optional, but I like it). Stir in cheese if using. Calling all food lovers (all of you, I hope): I am wanting to do a special post featuring readers’ favourite healthy autumn comfort foods. 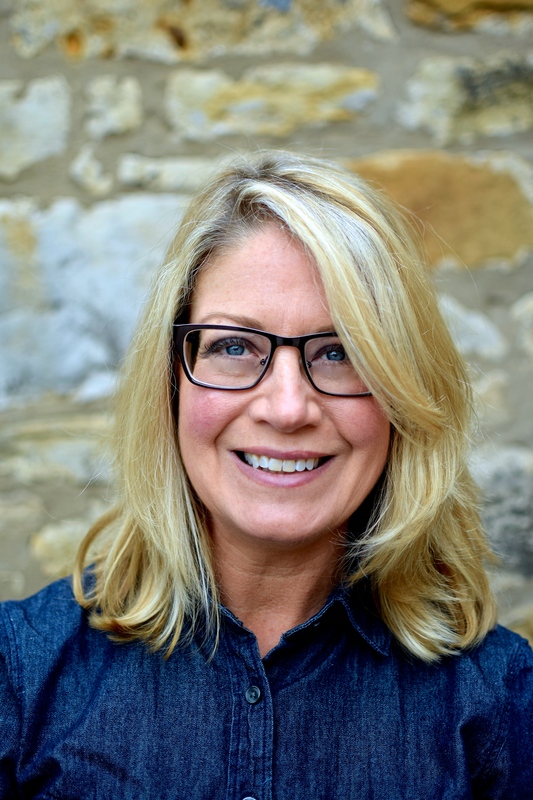 It would be wonderful if you could send me – via the comments button or ksfanderson@gmail.com – links to your favourite recipe, or mention of your favourite if you are not a fellow blogger. Whether you have a healthy, lower-fat take on macaroni cheese, or you do a mean roasted vegetable and tempeh bake, I want to hear about it. It doesn’t even need to be a recipe, it could even be a mention of a favourite childhood dish, a go-to comfort ingredient (or would everyone say pasta! ), or a cafe’s great soup. Shy folk can remain anonymous but I would really like for this to be a post where all of you can ‘meet’ each other through your own recipes and ideas about what’s healthy and comforting. I hope to hear from you soon. Hi Kellie, I am so delighted with the update about Max! He is a really gorgeous boy, love his expression in that photo! The soup looks great but (this’ll sound stupid) does it taste of courgette? I don’t like courgette as a rule but I like to try new things, I don’t like cooked peas unless they’re pureed or in soup so was wondering if this would be similar? Max says ‘thank you’. He’s going to get a big head with all the compliments on his good looks. Regarding the courgette taste, if you like courgettes in other things I’ve made for the Centre you will like this. 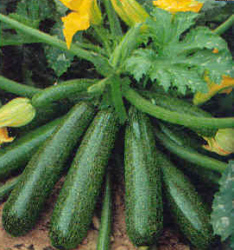 They blend really well with the pesto and are not assertive (courgettes are very unassertive typically). I think they will be similar to what you feel about peas, so have a go Miss Rosie. I’m not overly fond of peas on their own either, and Miss R isn’t mad about courgettes on their own, but we love this soup. By the way, not sure if Mr A told you this or not but I find your blog really easy to read and your recipes and the way you lay stuff out is the best I’ve seen. Being dyslexic makes me a real critic of this kind of thing – I’m not just complimenting because I like you. Kellie, so nourishing! Yummy! Zucchini (courgettes) grow profusely in my vegetable garden, so this recipe will be put to good use! Here is one of my favourite Autumn (fall) soups, a pumpkin medley with nutmeg. 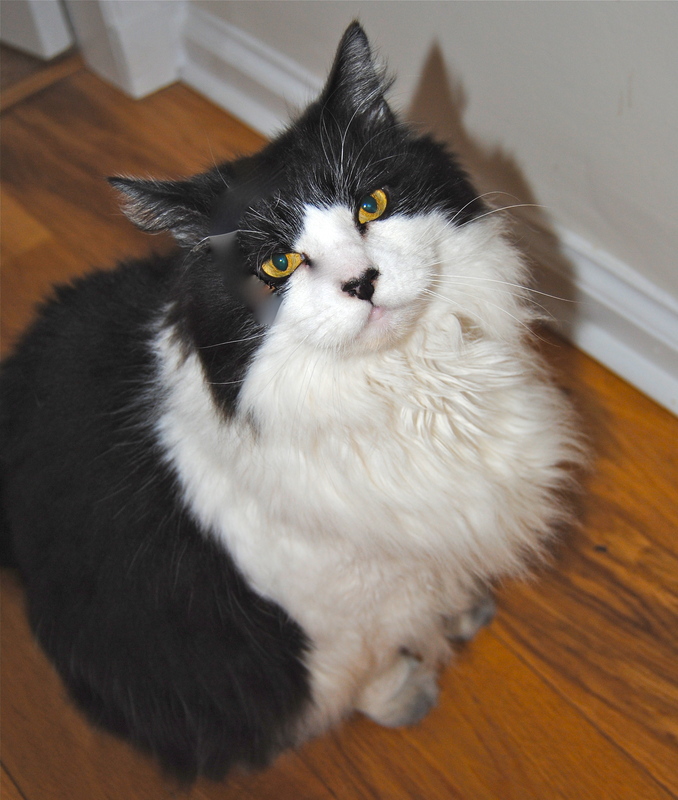 I am SOOOO Pleased to hear about Max, I was hoping that he would get better, just as my parent’s cat Gizmo did…..wonderful!! LOVELY looking soup too, so vibrant and tasty, I LOVE bright soups, they promise wonderful veggie flavours and this one is a beauty. Hi Karen! Yeah, it was touch and go a few times but I think he has many more patrolling and posing days ahead of him. And I do hope you get a chance to try the soup – it’s so easy & yummy. My pics don’t do the colour justice though. Must get better at photos! YUM! I love pesto so I can’t wait to try this! Bookmarked – thank you! I am ready for comforting soups, crusty bread and lots of warming fall spices! 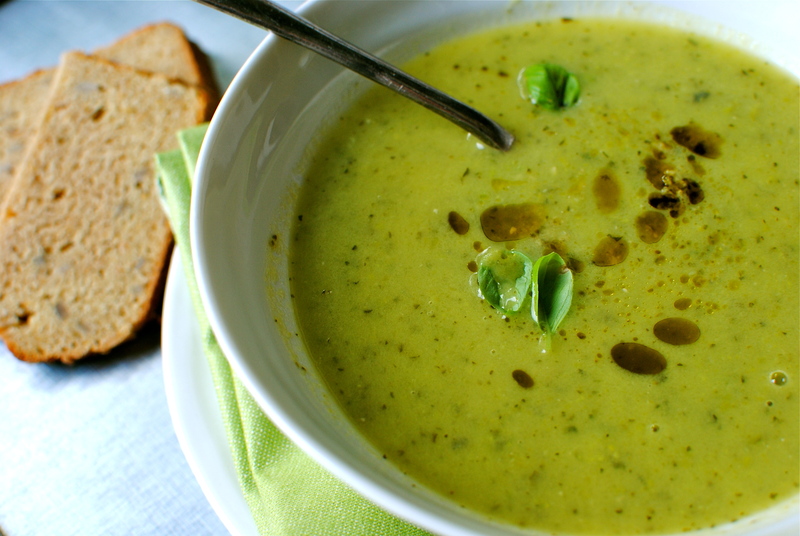 Your courgette, pea and pesto soup will be a appealing addition to our autumn dinners. Very, very glad to hear Max is better! I can’t believe California is cold enough for comforting soups but I’m glad you like the look of this one! And thanks for good wishes about Max. More tests tomorrow but we think they should show yet more improvement. Thanks so much! That’s quite an accolade coming from you 😀 Your tomato and basil is my fave bought soup – love it! Ah California! We have had early rain this fall. Hence, I began to prepare soups and stews. Now we have sunshine again! My sad scraggly tomato plants, got so confused, sigh. But Max is happy to enjoy his spot in the living room sun! Our plants got confused with our week of unusually high temps, but we are firmly, irrefutably into Autumn now. I don’t mind because until it gets really cold we have an amazing choice of produce here in Scotland. Come December it’s a bit on the root crop side, when we have to get really creative! I just loved your courgette, pea and pesto soup that I tasted at the 15th birthday celebration at Maggie’s Edinburgh yesterday. I can’t wait until next summer to be able to make some for us to enjoy it again. Thank you so much for sharing the secret on your web-site. It will also be a great winter warmer to have on the boat. 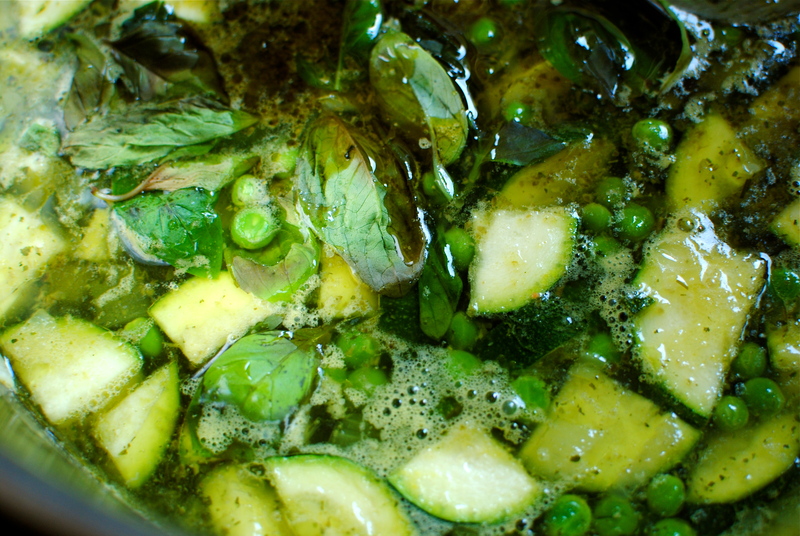 Well I eventually got round to making my version of your courgette soup, no peas, as we are in the middle of a glut. 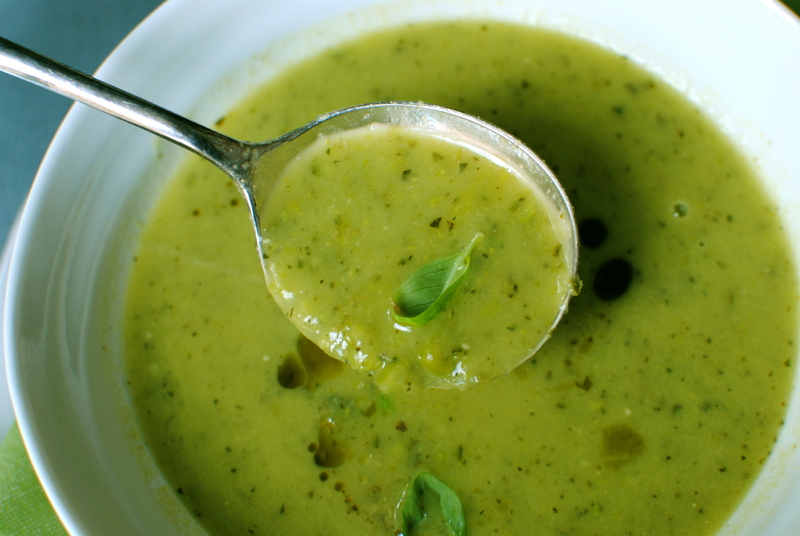 I often make courgette soup but I’ve never added pesto, it’s a game changer, we loved it. I also added some garlic croutons and a few pine nuts. Delicious. Thank you. Sorry for my late reply – just seeing this! I’m so glad the pesto was a welcome enhancement. Your own enhancements sound great! Pine nuts as garnish?